Art is important for children especially during their early development. Research shows that art activities develop brain capacity in early childhood; in other words, art is good brain food! Art engages children’s senses in open-ended play and develops cognitive, social-emotional and multi-sensory skills. As children progress into elementary school and beyond, art continues to provide opportunities for brain development, mastery, self esteem and creativity. Ice Tunnels: Bring on the Summer Fun! 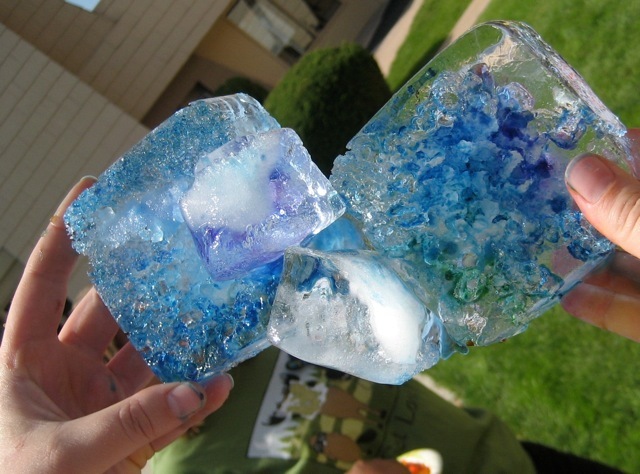 Summer is a wonderful time for outdoor art and sensory science activities you can do outside. "Ice Tunnels" combine ordinary salt, ice and Colorations® Liquid Watercolor in an unforgettable art and science experiment that costs only pennies. Try this on sunny day with lots of bright sunlight and you'll experience amazing color, light refraction and salt crystallization with the ultimate "hands-on" experience for children of all ages. 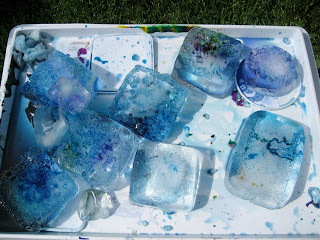 To make "Ice Tunnels," fill up a variety of plain plastic containers with water and freeze overnight. 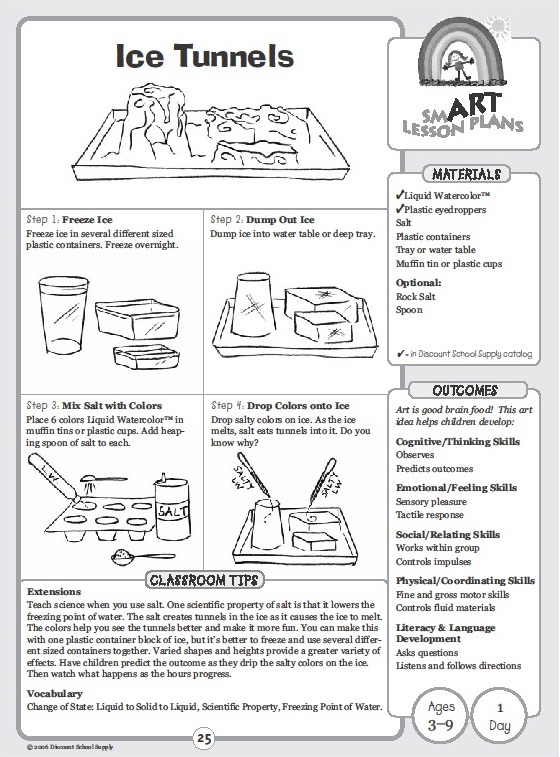 Dump the ice onto an art tray or sand & water table, and follow the simple directions attached below from Smart Art 2. Use ordinary table salt or experiment and find different results from using "Ice Cream Salt" which is sold in most grocery stores next to the table salt. Get the printable instructions here! 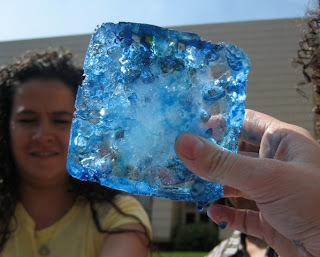 What happens when the salt, color and ice sit out for a while and begin their tranformation? Salt is an interesting mineral with many unique properties. It lowers the freezing temperature of water, so it corrodes little crevices into the ice as it melts down portions of it. These crevices, or "nooks and crannies," show up beautifully when liquid color is dropped into them. 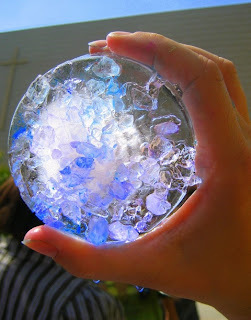 As the ice chunks sit in the sun, the salt will create more crevices and as it does, the liquid color moves, blends and sparkles in the light. Hold up to the sun for a wonderful discovery that looks almost like a crystal! If you leave chunks of ice touching each other, the salt will make some of them stick together after you leave them on the tray for a while. Can you guess why? It's the corrosion happening between the walls as they touch each other. Amazing, huh? Here are a collection of salted ice chunks after about a half an hour in the sun. We used mostly blues here, combining Colorations® Liquid Watercolor in teal, blue and turquoise. Let children select their own colors, or experiment with the primary colors (red, blue and yellow) and watch wonderful secondary colors naturally occur. 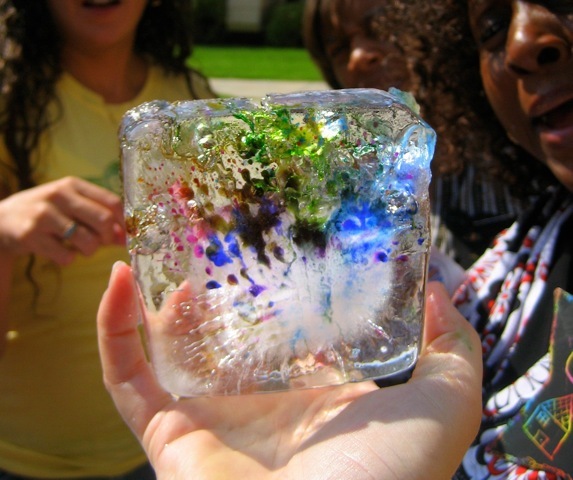 There's so much to see as you watch the ice, salt and color transform, so bring out the magnifying wands as you enjoy this activity on a warm, sunny day. Find more creative art lessons in Smart Art 2. Shop here for your own copy! This looks great, I cannot wait to use this with my students. BEAUTIFUL!!! I'm going to try this with my class FOR SURE! I'm in love with this project...art and science together always floats my boat :] Thanks for sharing! Awesome! 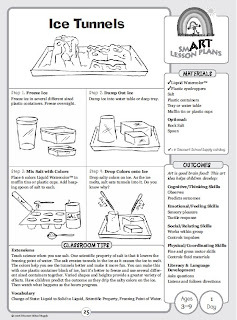 I was looking for a fun science-art activity for my son's upcoming birthday party, and this is perfect! Thanks! fantastic idea! I have a science assignment coming up and this is going to be used! I found a professional Canadian artist that specializes in ice painting. His name is Gordan Halloran. Kelly thanks for posting that Canadian ice artist's name - I just Goggled him (Gordan Halloran) what fantastic art! Amazing, so well worth a look up. This is also really fun to do with balloons so you get a great roundness.using boiled and cooled water makes it crystal clear without air bubbles. Ice Tunnels looks very beautiful at night as they shine more and more due to glitters......I love ice tunnels!!!!!!!!! Tunnels! Awesome idea! We just did some ice play in bricks. I'll link you up. Come on over and have a look seedsandclovers.blogspot.com. AWESOME! I'm soooooooo looking foward to doing this tomorrow! Its looking really beautiful. Great work.